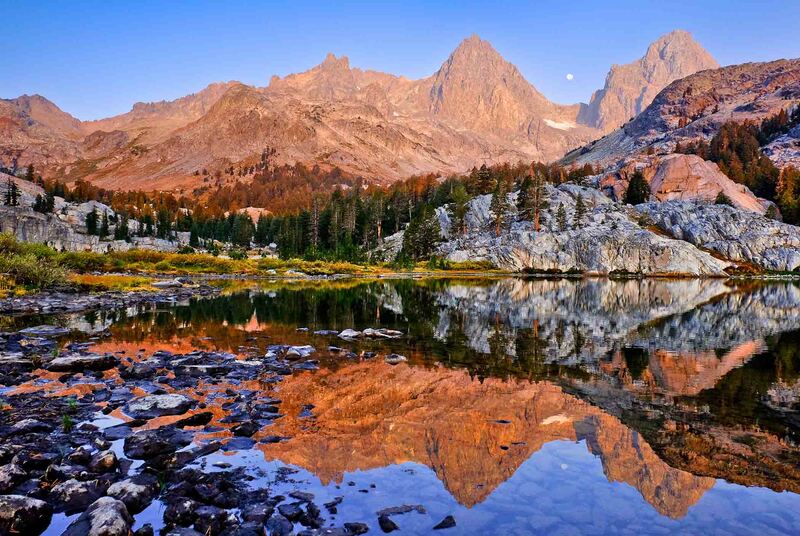 Pack your hiking shoes, pack and trail reserves, because you won't want to miss out on the stunning views offered by these Mammoth Lakes hiking trails. With 85 Mammoth Lakes trails, there is a trail to suit everyone from novice to accomplished mountaineer. We've picked out some of our favorite Mammoth Lakes hiking trails, and have them listed in order of increasing length below. Tip: If you're coming from a low-elevation area, you will need to give your body a few days to acclimate before hiking any difficult trails. Some of the shorter hikes in this guide are perfect warm up hikes! Remember to bring water, a snack and a light. 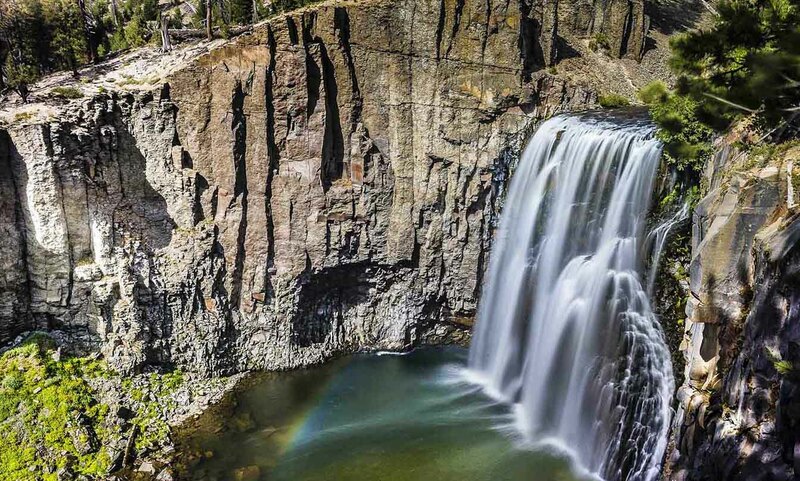 Rainbow Falls hiking trail at Mammoth Lakes is a 1.7 mi trail, offering spectacular waterfall views from within the John Muir Wilderness area. This sandy trail is wide and relatively moderate. It's very popular among families and Mammoth Lakes visitors because it is easy to access and makes for beautiful photos. The hike takes you to an overlook, and hikers can choose to continue to the Lower Falls if they're feeling energized. 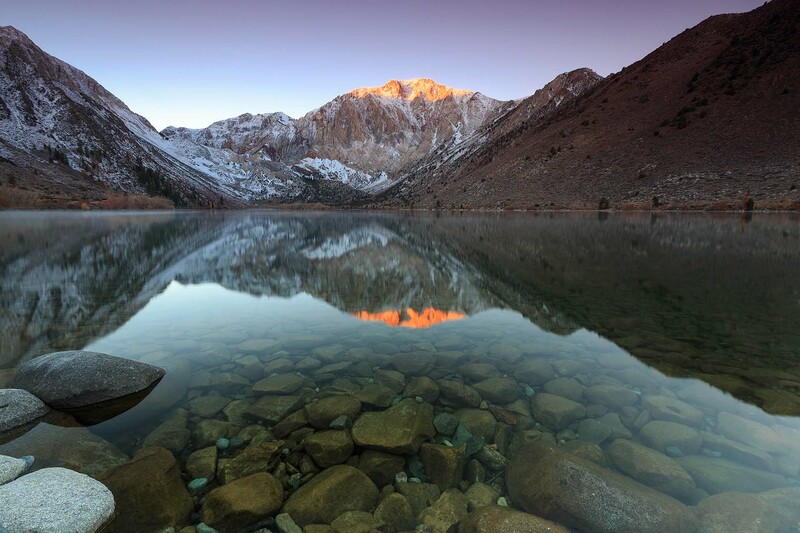 The story behind Convict Lake's name is as interesting as the area is breathtaking. Hikers will get the chance to stand on the soil where a historic shootout took place between Nevada prison escapees and the desperados who captured them. The Convict Lake Loop is an easy, 2.0 mi trail that circles the lake. It is a popular spot among fisherman, with abundant trout. This loop is great for families with smaller children because it is extremely moderate in terms of elevation gain. With steep elevation gains and prominent rocks and roots, the Valentine Lake Trail is better suited for hikers with experience, who have given themselves an appropriate amount of time to acclimate. This 9.2 mi trail offers a great workout with expansive views of the Long Valley Caldera. Dogs and horses are welcome on this difficult out-and-back trail, so you can enjoy the views with your favorite furry companion. While the lakes at the Shadow and Ediza Lakes Trail in Mammoth offer peaceful views, the real stunner on this 13 mile out-and-back trail is the river which runs alongside the trail. People thin out past the first few miles of this moderate trail, and it's an excellent spot for birding. Dogs are also welcome on leash, and wildflowers speckle the mountainside. Don't forget to pack a picnic, rain jacket and plenty of water (or a water purifier) for this long hike. Enjoy these beautiful Mammoth Lakes hiking trails and more when you stay with Mammoth Mountain Reservations. Book your Mammoth condo today and start planning a memorable trip, filled with hiking, biking and more.